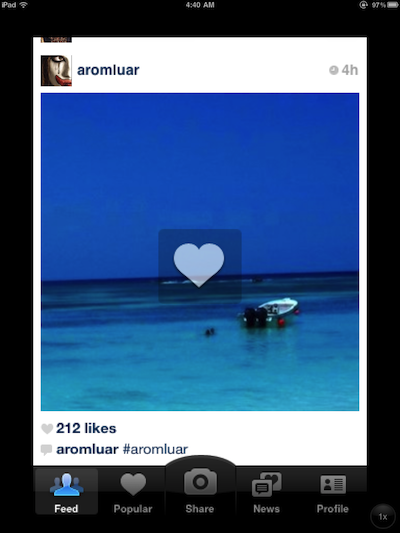 Instagram, that free photo sharing social network app, has gotten a nice update. While Instagram isn’t a Universal app or has a iPad version available, our love of the fun service means we have no issue running this app in 2X mode. You do not have to have a iPad2 camera to be part of the photo sharing fun. Also in this update is ‘autocomplete’ names. When your commenting, in the new enhanced comments area, you can put in a @ and then start typing a person’s name. If they are in Instagram, the name will auto complete so you can get on with your comment. The app was already running faster on the iPad over our iPhones so these new features make it all the quicker to get in to see our friend’s posts, like, comment, and get back to call we are supposed to be paying attention to.